Grows in the evergreen forests of Thenmala, Ranni and Wynad. 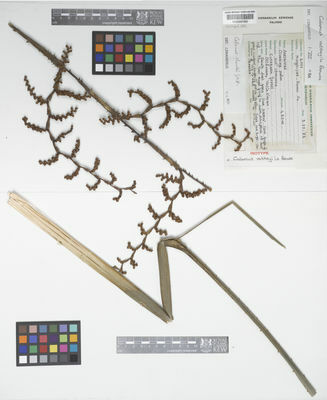 Sporadic in distribution between 200-750 m.
A high climbing rattan; stem cluster-forming, 15 m or more long, with leafsheath 2.5 cm in diameter; naked stem 1.8 cm in diameter; internodes to 27 cm long. Leaves ecirrate, to 1 m long; leafsheath dark green, sparingly spiny, spines 2 cm long, upwardly pointed, infrequent; leafsheath knee conspicuous; ocrea 5 mm long; leafsheath flagellum dark green, 4 m long, petiole to 25 cm long, armed with about 1 cm long spines; rachis armed below with digitate claws; leaflets dark green, alternate, oblong, 40 x 10 cm, prominently 6 nerved, bristly at apices. Inflorescence flagelliform; axial part near base 1 cm in diameter; partial inflorescences about 5 in number, 28 cm long, once branched, with closely shehating subtending bracts; each bract lanceolate at upper free part; axial part of inflorescence armed with 3 mm long spines; rachillae 5 cm long, with distinct alternate cup-like bracts. Female flowers 5 mm long. Fruit oblong, falsely pedicellate with distinct columnar 4 mm long beak, 2.8 cm x 1.4cm., fruit scales light brown, minute, without channelled at middle, arranged in 25 longitudinal rows; 1-seeded, seed sculptured on one side, oblong, 1.5 cm x 8 mm. A slender climber; stem without leafsheath smooth, light yellow in colour, 2 -4 cm in diameter near base; internodes smooth, to 20 cm long. Leaves ecirrate; leafsheath with flagellum; rachis slender, bifaced, upper margins of rachis infrequently armed with 2 mm long broad-based hooks; under surface armed with scattered, broad-based 1 mm long spines; leaflets alternate to subopposite; inequidistant, lower leaflets oblanceolate, to 30 cm long, 5 cm broad at widest part, wedge-shaped at base, apiculate at apices, prominently 5-nerved, nerves slightly bristly on upper side, spinulous at margins; middle leaflets elliptic to broadly lanceolate, to 20 cm long, 6 cm broad at middle, narrowly cuneate at base; upper leaflets sometimes 2-3 lobed at distal part; terminal leaflets irregularly connate at base, sometimes one attached slightly above the other. Female inflorescence flagelliform; partial inflorescences twice branched; rachillae scorpioid, to 8 cm long, 16 - 20 in number, each attached about 1 cm above the mouth of the respective basal bracts; secondary bracts funnel shaped; involucrophorum not pedicelliform, with a neuter flower on one side; involucre disc-like. Fruit globose to sub-globose, 1.5 x 1 cm, abruptly beaked with 3- distinct stigmatic projections; fruiting perianth cup-like at base; fruit scales deep yellow, wedge-shaped with lip-like postichous part, distinctly channelled at middle; seed ovoid, 10x8 mm; endosperm ruminate. The original specimens were collected from moist forests of Coimbatore. The cane is strong and can be suitably utilised for making furniture. Intensive survey of this species is needed for assessing its cultivation prospects.